We’re spoiled for choice and surrender to the convenience that food delivery facilitators provide! Decision convenience: Zomato & Foodpanda use ratings and reviews for those driven by public opinion. Access convenience: SpoonRocket offers super-fast delivery within 15 minutes. OrderAhead allows you to skip the line. What an excellent UVP for those who hate waiting! Transaction convenience: most apps have more than one payment option (card, PayPal, Apple Pay wallet). Benefit convenience: Postmates delivers from more than one restaurant in a single order. No limits to your fantasy! Post-benefit convenience: Repeat orders are always faster since the app saves your address & payment details, and even your favs so re-ordering takes seconds. Convenience is a core characteristic of the product and it’s ultimate business value. So it gets paid for. Our gastronomic habits vary and so do the apps. Apps like Instacart target busy professionals who want healthier options from upscale grocery stores like Trader Joe’s. Instacart doesn’t deliver cooked foods, and it’s not an app that hungry college students will use late Friday night to order pizza. Goodmeal attracts healthy eaters and those on a particular diet. Millennials would graze rather than eat a square meal. So they are shifting their preference from the traditional dine-out to mobile on-demand food delivery services like Pizza Hut, Domino’s, Papa John’s and Burger King. UberEATS is also all about making tech-savvy millennials happy. Operating in the biggest US cities (as well as a number of European cities), UberEATS delivers a wide selection of foods. Postmates is similar to UberEATS, and shares the same target audience, millennials. But it has secret weapons of its own (that we are to reveal shortly). China ($41,665m). Poster kids: Ele.me, Meituan Waimai, Didi, and Baidu Waimai. United States ($20,186m): GrubHub, DoorDash, UberEATS, Postmates, Eat24, Caviar, and Amazon. India ($7,120m): Zomato, Google Areo, Swiggy, Nature’s Basket, and Ola. United Kingdom ($3,357m): Deliveroo, Just Eat. Germany ($1,997m): Foodpanda, Lieferheld, and Pizza DE. Though most apps operate locally, there are some global-scale players like GrubHub (US & UK) or Delivery Hero (40+ countries in Europe, Asia, Latin America and the Middle East). The aggregator (order-only) model (Just Eat, GrubHub, Delivery Hero, Zomato; the last one is extending its capabilities to include delivery after buying Runnr, a hyperlocal logistics startup). Order-focused apps are primarily restaurant discovery engines. 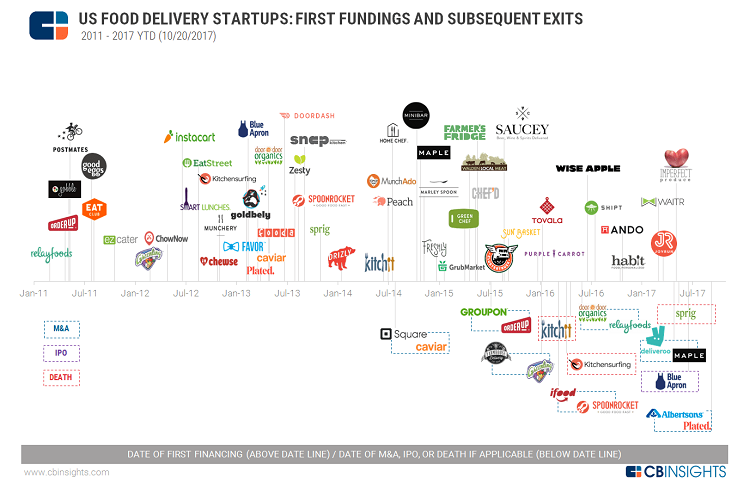 The order-&-delivery model (Caviar, Deliveroo, Doordash, Instacart, Postmates). 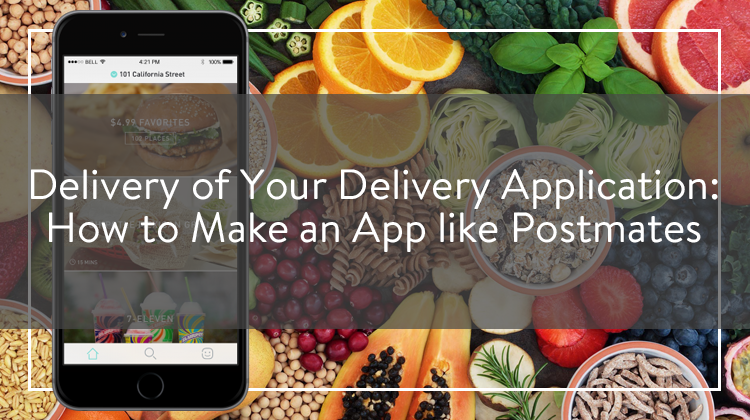 Logistics-focused apps are platforms or marketplaces to unite various groups: customers (placing orders), eateries or stores (providing food), and couriers (delivering the orders). Logistics-based food ordering systems accounted for larger market share of 48.6% in 2017 and have proven results of higher EBITDA as compared to other business models. Full-service (integrated) model (Maple, SpoonRocket). The entire-meal-cycle apps aim at making food accessible to everyone and delivering it. This was traditionally done by phone (a customer phoning a restaurant to order a meal delivered to their place). Now restaurant owners have web and mobile applications to take care of that, among other activities. It’s an early morning. The city is still warm from its sleep. But there’s hidden life of thousands of couriers shipping goods to grateful clients. Who’s the sorcerer? Postmates – a remote control for merchandise delivered to your doorstep. Available 24/7/365, Postmates delivers goods on demand in over 100 US places. To date, it’s doing three million deliveries a month with a gross merchandise volume of $1.2 billion. Postmates competes with public companies like GrubHub and Yelp and looming behemoths like Uber and Amazon. When pitching for his startup, Bastian Lehmann, the co-founder and CEO said, ‘We’re betting on the huge trend that local inventory will become unlocked and available to purchase, even in smaller retail stores, because you won’t have to go to the store any more’. Well, Postmates may have been a bit ahead of time, but it got the company its early adopters who spread word and literally set the trend. This also saved 80% of marketing effort. Despite being an ultimate objective, money is a major concern for startups. Getting to the other side of the death valley is challenging. 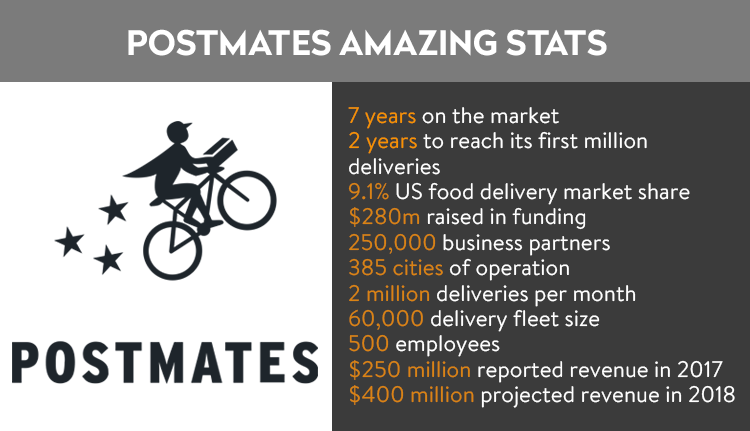 Getting ROI fast made all the difference for Postmates. It also gained them trust of early investors. Early success created a positive loop. It attracted some important investments and partners. Postmates has got official tie-ups with 7-Eleven, Apple, Mcdonalds, Starbucks, Walgreens, Chipotle and many other well known companies. The company was serious about staying there and becoming part of a city infrastructure, very much like FedEx is for stores and businesses. And that’s risky and brave at the same time. Acting on the crossroads of high demand, competing with giants like Uber and Amazon, and a host of smaller delivery services, companies like Postmates still have a promising future. 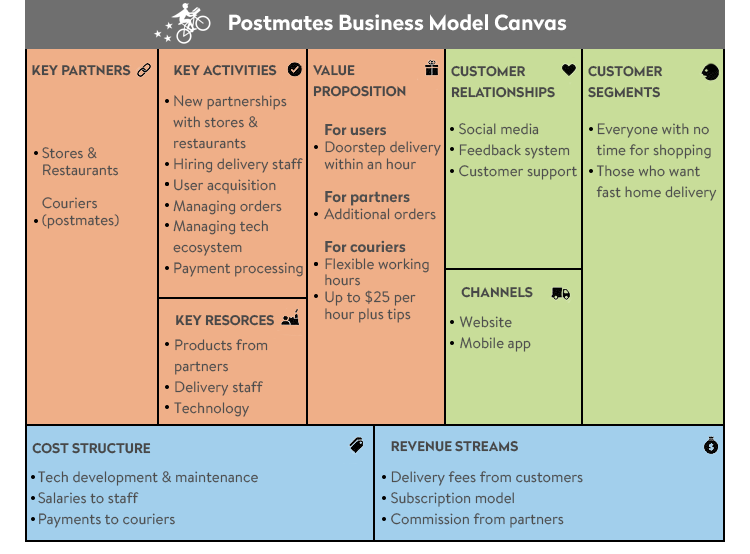 So what makes the Postmates business viable? Operating a crowdsourced marketplace is no joke. You have to make all parties happy with your product – solve retailers’ problems, gain extra visibility to restaurants, keep couriers busy and motivated, make customers happy. Finding a viable business model has been a stumbling block for many startups in the last-mile delivery business, including UberRUSH, Shyp, and Doorman. Of all the existing delivery companies, Postmates has stayed the longest and gained the investors’ trust. What makes their business model so invincible? Let’s take a close-up. Postmates isn’t just about food delivery as it delivers pretty much everything in the neighborhood. Determined to be a one-stop delivery service from the start, it has never gone back on its promise. Bastian Lehmann dubs it a ‘Google for delivery’. So the company is at the intersection of fetching meals and food (like Instacart or GrubHub) and last-mile delivery (Uber, TaskRabbit), being the right hand of UPS, FedEx, DHL, and the U.S. Postal Service. Despite the strong competition, this UVP has done a great service to the company. Buyers: those willing to pay a bit more for the convenience of goods delivered to their home. Merchants and restaurants: they benefit from extra orders and are willing to pay for better visibility of their business. 25,000 partner merchants on the platform, and tenfold as much of independent merchants provide a comprehensive merchandise inventory. Couriers (aka postmates): these are independent contractors willing to monetize their extra time and effort of goods delivery. The network of couriers comprises drivers, cyclists, as well as walkers. All of those are coordinated by a tech team on a digital platform and a mobile app. Crowdsourcing delivery companies are in high demand among retailers as well as large delivery businesses as they help make last-mile delivery faster, more personalized, and cost-efficient. Delivery fee. Postmates charges an average of $5 for every order. Distance is no longer factored in the delivery price, but you can end up with a maximum of $20 service fee, depending on the basket size. The fee is an 80/20 split between the couriers and the company. It’s subject to surge (‘blitz’) pricing, same way as Uber. But delivery fee alone doesn’t make a viable model. You need other sources, as well. Convenience fee. The service also charges 9% flat fee for convenience. There is no cap on this fee, says Techcrunch. Merchant program. The service partners with a number of large retailers and restaurants on a premise that the customers who order from these stores get charged a lower delivery fee in return for the store selecting Postmates as their preferred delivery partner. While other services, like Instacart, mark up the groceries offered on their platform, and keep some of that margin to themselves, Postmates and Doordash charge a referral fee from the restaurant from which they deliver. In other words, all these startups ‘own’ the customer at the checkout point, and therefore take a ‘cut’ of the transaction. No delivery fees on orders over $20. No peak hour blitz pricing. Your order is automatically accepted and moves to the front of the line. Omni-channel strategy is crucial to beat competition. But visibility is not enough. Retailers and restaurants increasingly depend on last-mile delivery companies to cater to the needs of consumers. Today’s 35% of market penetration is predicted to double in four years. On-demand delivery market has the potential for robust growth. The global food delivery market is fast growing. The worldwide revenue of US $96.2 billion in 2018 is expected to increase to US $146.7 billion by 2022. The key catalysts for the adoption of online food delivery are the overall level of funding for the industry and the size of marketing budgets. Emerging technologies are changing the rules of the last-mile delivery. Time is critical in delivery business, but so is the cost. Last-mile has always been the most expensive and the least efficient. But we have all the potential to turn things round. Delivery droids, drones, and AI solutions are coming to rescue. Smart logistics have never been in greater demand. Select a restaurant. The places are sorted by location, type of cuisine, etc. Or you just enter the name. And there are not just restaurants to order from. In fact, you can order all sorts of things – from liquor to clothes. Add details of an order. That’s where the magic really starts. Every restaurant keeps the entire menu online! So customising an order is a piece of cake. The app foresees all the possible outcomes like what to do if an order is unavailable. It’s surprising how making on-the-spot decisions face-to-face can be challenging. But with the app, you have all the time in the world. Confirm an order. View and confirm the items on your order list, an estimated subtotal and delivery time by clicking ‘Get it now’. Track an order. A customer can see the exact location of their order in real-time. Rate the delivery. Once your order has been flagged as delivered there is a feedback/rating system that allows you to comment on your experience from start to finish. Tipping a courier is also enabled by the app. Every user role has access to a particular set of features on the platform. The following three sets will make a perfect minimum viable product for a customer, courier, and restaurant/store. Real-life situations dictate that an IM feature connecting a customer with a courier is crucial. Whether it’s an item to replace or directions to ask, a call can be less convenient in a busy place. Instant messaging rules out any misunderstanding. Approval of all the necessary changes will make a customer happy. ‘Pickup’ is a feature that allows you to pre-order an item so you can pick it up later. The feature, first rolled out by Square’s Caviar after the company’s buyout of OrderAhead, is fresh on Postmates and expanding their reach. A customer initiates a group order (from a particular place). S/he sets a timer for the order during which other parties can join in. The neighbors who join in during the validity period increase the discount. If no one joined, there’s no delivery discount. One driver picks up all the orders destined for a particular neighborhood. Speech recognition technology allows to develop/integrate conversational interfaces like Siri to take voice orders and respond to queries. Domino’s Pizza chatbot ‘Dom’ allows consumers to begin placing an order by sending a message that only contains the word ‘Pizza’. The company attributes its estimated $4.7 billion in ‘global digital sales’ in 2015 to its investments in innovative technology. They allow users to choose meals based on personal food preferences. The Los Angeles based startup Halla claims to break down dishes the way Pandora or Spotify break down songs – analyzing common patterns (in this case – of flavor or ingredients, not of sound or rhythm) to suggest restaurants that have meals to suit what the user wants most. Looking to build a scheduler app? Check out our case studies of creating a join-a-game mobile app for soccer lovers and a short-term rental app for venues. The figures and rates below are the average for a mid-sized Eastern European web and mobile development company like CodeTiburon. Helping our clients to create a better app than an already existing counterpart is part of our strategy. So a starting point of our interaction is how can we make it better. One way is by harnessing the cutting-edge tech innovations. Each of these requires algorithms and analytics to better address consumers’ expectations for speed, flexibility, and/or lower delivery costs. Keeping all the inventory in one place provides users with more accurate information on an item availability and estimated delivery time. An algorithm chooses the nearest location to the user. If a delivery company is doing the search for their clients on a 3rd-party site, the advanced analytics with pick the most profitable match. Once an order is placed, choosing a courier depends on pick-up and drop-off locations, requested time, price, and availability. The matching happens either through a centralized assignment mechanism using a high-quality matching algorithm or mutual search via an effective search algorithm. If a delivery price is not fixed, the two pricing mechanisms are auctions and a centralized pricing algo. With the former a customer chooses the proper bid, with the latter – a courier with an appropriate hourly rate. Merchants may have more than one option of a courier. The selection is done on the basis of price, speed, and the availability of services such as order tracking. While dynamic routing allows delivery companies to better respond to evolving requirements and constraints, it requires a timely and accurate feedback system and advanced optimization algorithms. Real-time updates regarding changes in the route, and innovations like geofences to inform customers of a delivery, add efficiency and flexibility to the process. Notifying customers of their order status, expected delivery time, etc. is a must. But what can be more efficient than two-way communication in case of changes? Instacart, for one, enables messaging between a shopper and customer in-between the start and finish of the order fulfillment. Advanced analytics allow to forecast the demand for delivery services. Based on past data, combined with other market information, it’s possible to better predict expected future order volume and plan operations (e.g., required number of drivers, delivery scheduling, and vehicle management) accordingly. Couriers largely determine a service’s overall quality. A rating system allows to evaluate key factors such as response rate and speed. Customer feedback is essential, especially about the issues like delay, broken or missing items. It’s also mutually motivational as it builds trust and helps improve the service. Learning from the best is just the first step in an exciting path of creating a new original product. Digging into technology and business aspects of the market allows you to make informed decisions. Feel free to ask for technical advice on your project. Make it better with us. How much does it cost to build a food delivery app with CodeTiburon?